Southern Rockies Nature Blog: When is a Lawn not a Lawn? When I was a kid, I made money mowing lawns, after we moved into Suburbia. (I guess Dad used to cut the grass at the ranger station — I was too young to do it.) I learned to tune up the Briggs & Stratton lawnmower engine (5 percent of the nation's air pollution?) and to face the big decision: Do I got around the edge of the lawn and then spiral inwards, or make back-and-forth stripes, boustrophedon-style? At some point, my outlook changed. 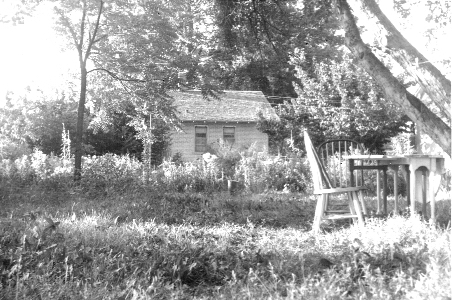 Maybe it was living the summer after high-school graduation in this sort-of communal house (four guys trying to be "spiritual") where the oldest, the organizer, saw no need to cut the grass around our little rented house near downtown Loveland, Colo.
Then the city came after him, so we cut the grass and front and let the back go wild, under the apple trees. That was something new for me, raised on the ritual of weekly mowing. Liberating, even. Fast forward: M's and my Manitou Springs house had only a tiny area of flat ground, which we planted to vegetables. The rental house in Boulder's lawn area had been covered with plastic and gravel in the front, and there was basically nothing but a tiny bit of dirt (enough for lettuce and onions) in the back. In Cañon City we had irrigation water, so again a big garden took up most of the back yard, ornamental plants much of the front, and I mowed the leftover bits to comply with city regs. No fertilizing. Why do we spend so much money and work so hard for what amounts to a biological wasteland around our house? Why do we spend hours of time and gallons of gasoline? Why do we water it when it withers in the summer sun only to spend more time and money to cut it down again? Lawn grasses don’t feed my family or invite pollinators onto my property. I’m not baling hay to feed cattle through winter. The best reason I could come up with for our culture’s obsession with a neat lawn is the man versus nature, bending it to our will motif — creating order, our version of it, out of disorder. And with this illusion of control we advertise to everyone else that we have the money and time to waste resources. That is from "Green Menace: The Futility and Stupidity of the American Lawn." Read the whole thing — it is where I got that air-pollution figure. When we moved into the woods, the idea of lawns seemed laughable. But now the minimalist lawn is re-purposed as a firebreak. Reduce fuels! No fertilizing. No weedkillers. No watering, beyond what Tlaloc sends us. I mow three or four times per summer, but I call it "fire mitigation," thus satisfying both me-now and the kid who used to mow for pocket money. For more: "Why Prairies Matter and Lawns Don't." How much lawn is too much? 41 million acres. That figure makes lawn the most widespread plant under irrigation in the contiguous US. Three times more acreage is covered in irrigated lawn than in irrigated corn, and that’s a conservative estimate. All of that once precious water used on those 41 million acres of ridiculous, non-native turfgrass to keep it unnaturally green – how can people be so blind? We have 2acres here, and what hasn't been turned into garden does get mowed. I'd love to let it go wild and turn it into a maintained prairie of some kind, leaving just a small patio area for sitting and enjoying, but the ticks and mosquitos LOVE that sort of space, and so we keep it mowed instead. We don't water it though, drought isn't something that happens here very often, our problem is usually to much water! You remind that the line between the West and Midwest is also cultural. I know that I am in the Midwest when I look around and see that they are mowing everything. North East technically here. But yah, if its green and its not the garden it gets mowed!